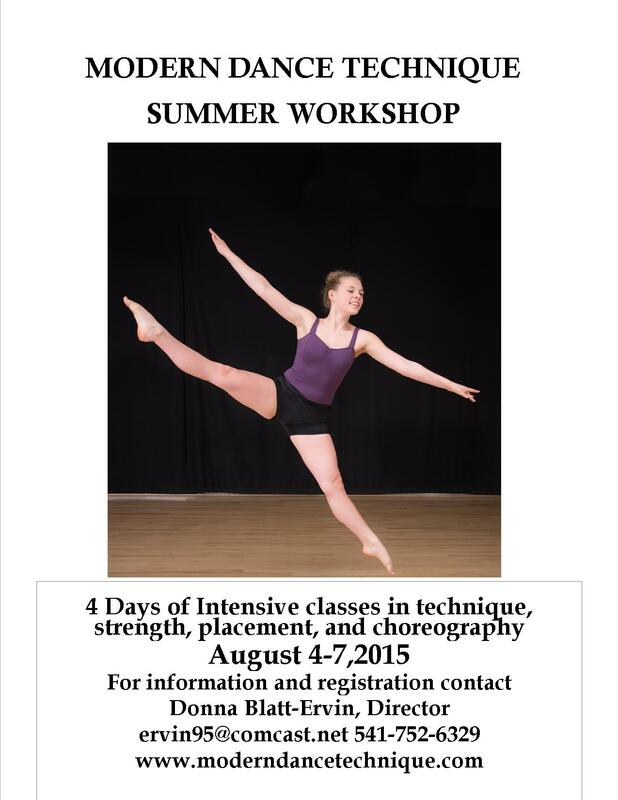 Calling all dancers! Alumni, anyone who is home for the summer who wants to take a modern class; or if your summer dance classes have ended! 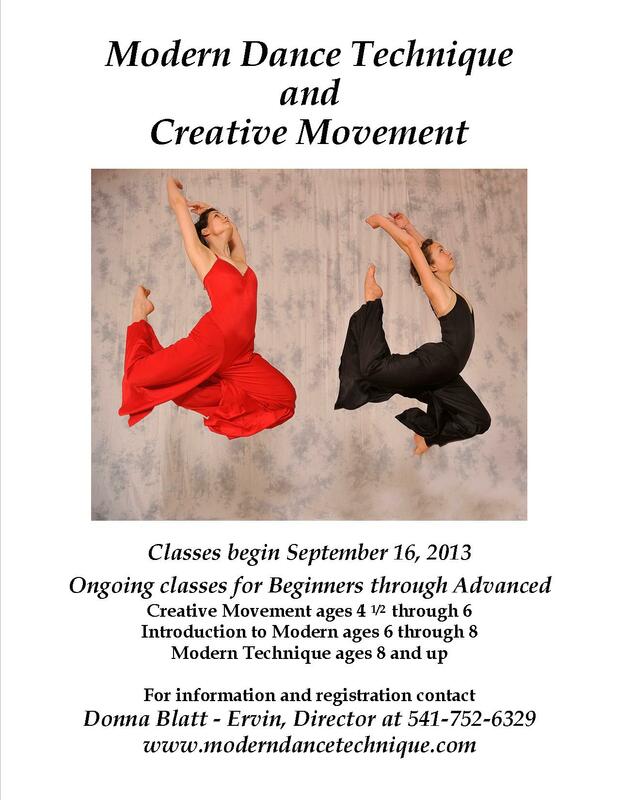 Classes will cover Modern technique,floor barre, stretch /placement, repertoire and composition. With most of our students returning for another year of Modern dance, this year is sure to be inspiring and fun for all! All levels of classes will learn exercises and movements based on Graham, Horton and Limon techniques as well as movements based on innovative developments in exercise and contemporary dance training. This year’s course offerings include Introduction to Modern Intermediate for ages 6-8, Modern I/II for dancers 8-11 with some previous movement training, Modern IV for the intermediate level dancer ages 13 and older, and Advanced Modern for dancers 14 and older with substantial training in Modern or Ballet. Our Advanced level dancers will also have opportunities to study with some of most talented guest teachers and choreographers in our area. Returning instructor Amy McDonnell and other guest choreographers will create new repertoire for our upcoming season. In addition to performing at our yearly recital in June at the Majestic theatre, this year all of the dancers enrolled in MDT will perform at our Studio on the Second floor; Works in Progress. 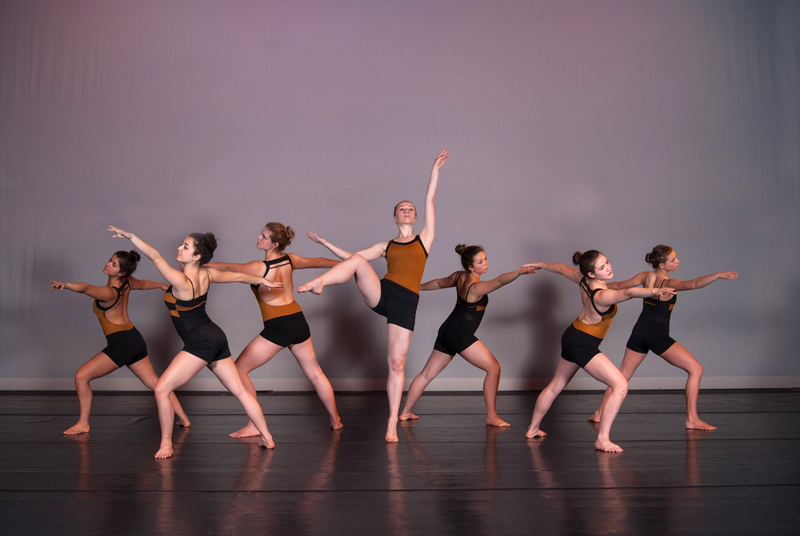 A bi- annual open house presented in the Spring invites parents, friends and any interested community members to a demonstration of class work, short dances and excerpts of this year’sconcert repertoire. After 24 plus years, I am still truly inspired to continue the training of interested and dedicated students. Each year our dancers evolve, deepening in their knowledge of technique and discovering the many possibilities of movement. I am gratified to accompany them on their journey to dance and always happy to have new students join us and discover their love of Modern dance. Come see our 23rd Annual concert! Modern Dance Technique’s 23rd Annual Spring Celebration of Dance once again demonstrates the value of Modern dance education in our community. Artistic director Donna Blatt Ervin brings 30 dancers and nine dances for a concert that will delight, inspire and entertain. Dances range from young dancers portraying Bashful Dragonflies to Bach’s Prelude in C to the energetic, aggressive, nonstop movement of the Advanced Performance group dancing Crow’s Dance to the music of Gabriela Roth and the Mirrors. Highlighting the concert will be several other dances by the Advanced Performance Group. Blatt Ervin’s Ritual Action of the Ancestress, danced to excerpts from the Rite of Spring by Stravinsky has been a favorite in the Advanced Performance repertoire since 1998. The classic modern technique of Martha Graham is excellently portrayed by this group of strong dedicated dancers. Also by Blatt Ervin for the advanced group is a re worked Seraphic Frieze to the music of contemporary cellist Sharlene Wallace. The dance is full of breath, light, and exhilarating leaps which transition to exciting balances and moments of tender connection between the dancers. A new work by Blatt Ervin for the intermediate students; Chava’s Lullaby is playful and haunting as the dancers portray both sweet dreams and nightmares to the lyrics of a Yiddish lullaby and music by the Klezmatics. Alumna and instructor Kayleigh Stark has choreographed the poignant Filigree for the advanced group to music by Mumford and Sons and Lilac Dance to the fluid piano of Helen Jane Long for the Teens Dance class. Rounding out the concert are young dancers in a delightful gavotte, Divertimento by Secret Garden. 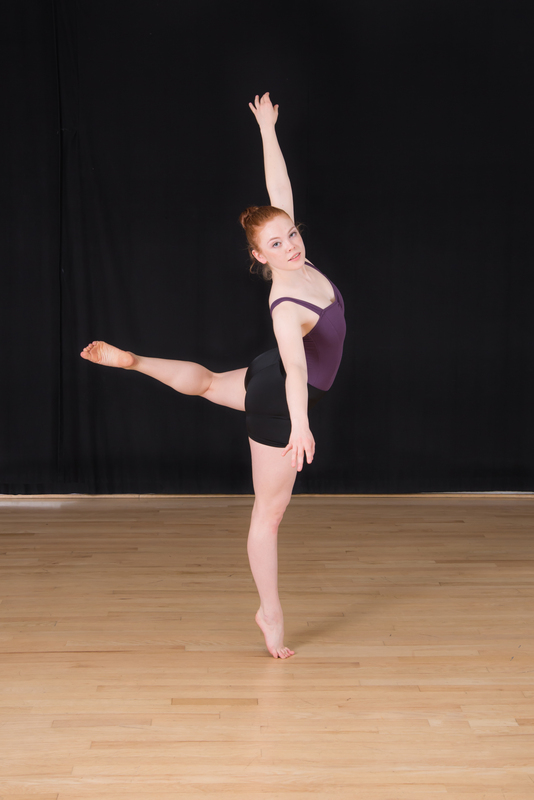 Guest dancer alumna Heather Fenske will dance in her UO Senior piece; detached which combines spoken word and music depicting an astronaut on her day off! 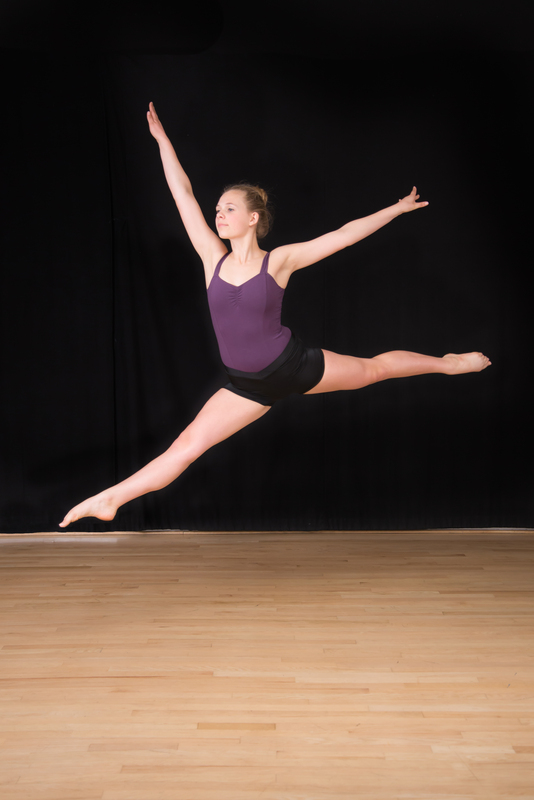 The MDT dancers have all been working hard in classes and rehearsals since September. 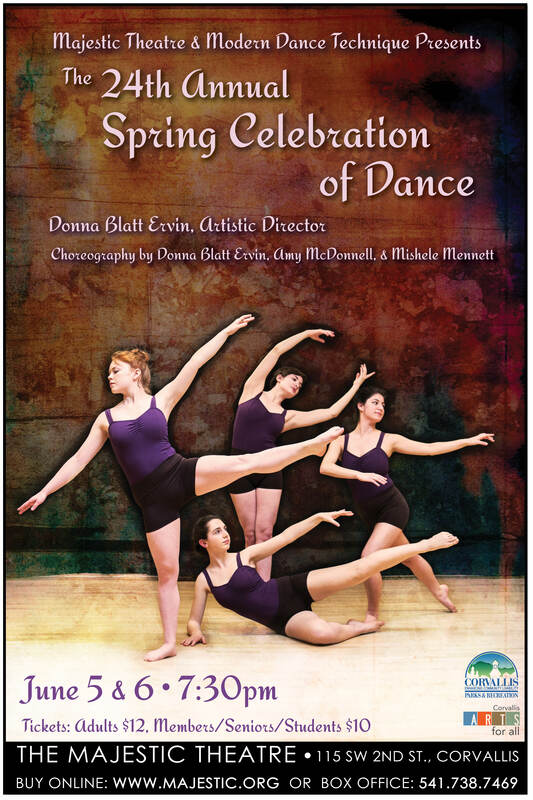 This 23rd concert reflects the high quality of ongoing instruction, creativity and love of Modern dance shared by Donna Blatt Ervin, her fellow instructors and their dedicated students. We are a dance program in Corvallis, Oregon providing Modern Dance classes for ages 6-21 (including beginning teens and advanced classes) and Creative Movement classes for ages 4 1/2 to 6. Registration begins August 19th and continues until classes are full. 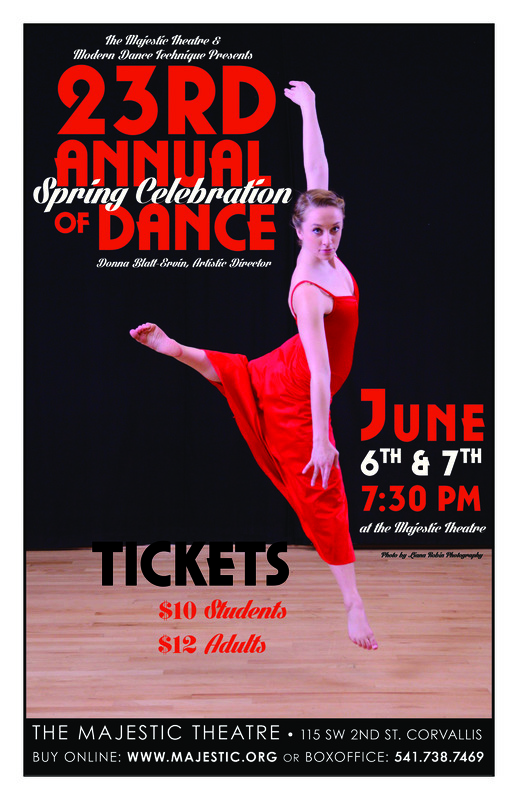 Our 23nd Annual recital will be held at the Majestic Theatre June 6th and 7th,2014. Please explore our website for more information! Thank you.